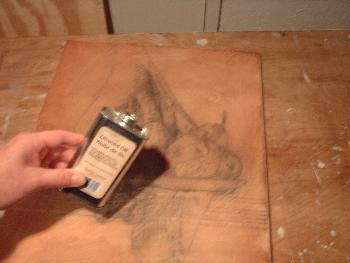 The umber under layer, or brown underpainting used in the flemish technique. 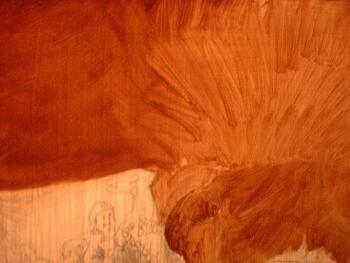 The Umber Under Layer, or the brown underpainting used in the indirect and flemish painting techniques. You are now at the Umber Under Layer portion of the lessons. You've selected your subject, and your ink drawing is completed. You have painted your first coat "imprimatura" and it has dried for awhile. If you used Damar varnish, it should be several days to a few weeks depending on your climate. If you used the alkyd medium, it should be the next day. You are now ready for the umber under layer. In this layer you will establish the overall contrast of your painting. We will talk about oiling out again, and the use of a natural product that contains ether oils and will help in the oiling out of your work! You will become a water-colorist during this session of lessons! I'll also talk a little about "dry brush blending". A very important part of this technique. Really, they are your secret weapon that are not very much talked about in schools! Once you learn this, you'll have the tools to make powerful pieces! Knowledge is power! 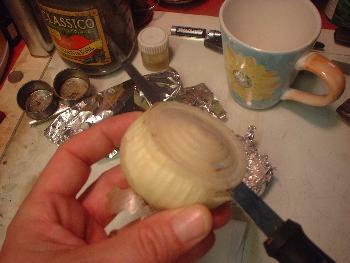 Get your crying towel out, because this is where in the umber under layer stage you use an onion. This is the natural product that just prior to oiling out, you prep the canvas by softening the last coat of paint just slightly. The juice of the onion has oils in it that will help you in the next step. Your layer must be dry before using this tip above. Test it to be sure. After slicing the onion, rub the exposed flesh directly onto the canvas. Use a circular motion to cover the entire canvas. The smell mixed with your lavender oil will make your studio have a very distinct smell. Don't worry, it doesn't stick to you like cigarette smoke will. After this, take a little linseed oil into the palm of your hand and rub this onto your canvas, (leaving the onion juice in place). Rub into the canvas. 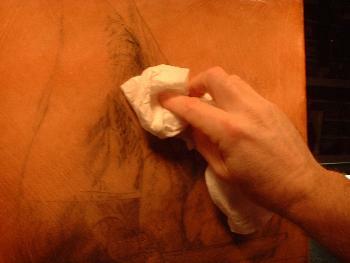 After this has been done, you will remove excess oils and buff the canvas with a lint free rag, or toilet paper (TP). This will leave a very thin film or sheen to the canvas that lubricates the canvas and facilitates your blending and paint application through out the process. You will then apply paint, burnt umber (why we call it the Umber under layer)that is mixed with a little turps/damar medium to the canvas. 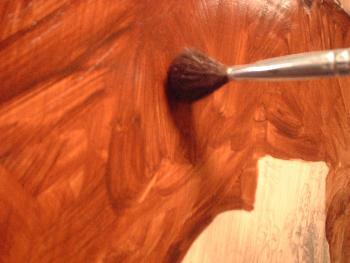 Umber also drys very quickly and is an earth tone, and easy to manufacture and thus cheaper to use! Using the proper mixture proportions discussed earlier. After applying your paint, use the a brush to blend slightly, remove or push more paint to areas necessary on the canvas. In this example I just wanted an even distribution of paint for the background and not much correcting was used. These next two photo's show one of my favorite secrets revealed. It is the use of the dry mop brush for blending. This tool alone enables you to make effects with oil paint that is thought only possible with an air brush. Its soft bristles and the manner in which you will use it will create a very even coat of paint. Completely removing brush strokes where only your color is seen. It will also help you create a graduation (transition from dark to light)in color or paint that will resemble the best in watercolor paintings' washes. he photo below shows on the left a blended area, on the right an incomplete area. 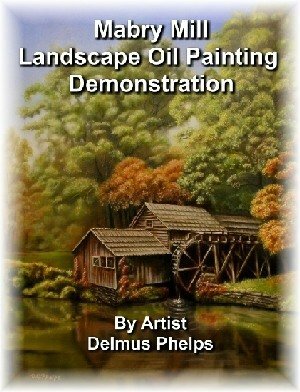 You will use this technique in the umber under layer and in every other layer except the final finishing layer where brush strokes, thickly applied highlights are left as placed to give the viewer the sense of built up paint that most folks like in their oil paintings. My e-book and DVD show more details on this part of the technique, just check the links on the nav bar (ebook lesson, video products) for more information. It's very difficult to describe this with photo's, but the DVD does an excellent job. 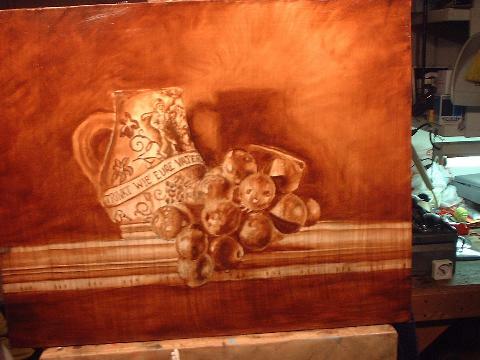 The completed umber under layer or brown underpainting. 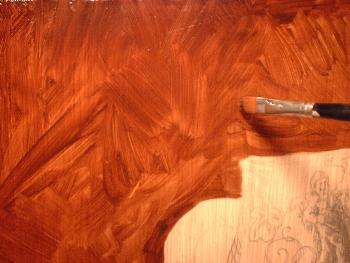 In this photo, you see the finished umber-under layer. It reassembles one of the old timey photo's. This layer is allowed to dry before proceeding. After allowing this to dry, You may want to darken some area's a little more. In this example, I went back and re-applied additional paint to the outside corners only to help focus the eye to the center. If you're all done, then you can proceed to the next step in the Classical Flemish Technique, the gray or dead layer. Maybe you'd like to see more examples? 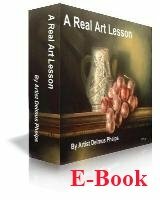 The "Real Art Lesson" e-book has a chapter on this part of the process with over 30 photos and more detailed explanations of just this process alone. I show you how to lift paint, achieve a graduation from light to dark that resembles watercolor wash, and how to make this step almost appear as a completed painting! You could have this valuable resource on your computer within minutes!